Looking forward to running this race for the first time. As you may know if you follow the blog, I have trained on the the trails at Medoc many times in the past. I don't find my way up there too often any more but beginning back in the late 80's it was a frequent stop for training runs on the way home from the Roanoke Rapids area. I finally made it to the Medoc Meltdown this summer and now I am an entrant in the marathon race. 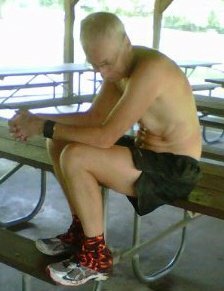 When I originally signed up for it my plan was to use it as a long training run for Mountain Masochist. The timing was perfect with it being three weeks after Hinson lake and three weeks before MMTR. However , with my shortened run at Hinson I have recovered very quickly and have gotten in some solid training the past two weeks. Everything seems to be going well, I'm feeling good and with a forecast for great weather I have decided to give it my best effort and race the thing. That of course depends on how my legs feel after the first couple of miles which I plan to start at an easy pace.